ROSWELL, New Mexico, May 12 /Christian Newswire/ -- Alien Resistance, a Christian counter-cult outreach ministry, will hold an all-Christian-speaker Symposium on aliens during the annual Roswell UFO Festival July 3-5th, 2009. The 11 participants include 4 PhDs, 2 doctorates of ministry, 2 pastors, 2 ordained ministers, and several pastoral counselors, with 12 books written between them on the UFO/Alien topic. The Symposium will educate on the UFO/alien topic from a Biblical Christian perspective, with emphasis on counter-cult evangelism, creationism, and spiritual warfare. The event is free for the public to attend, and will be held at the Best Western Sally Port Inn Ballroom. Tens of thousands of people interested in the UFO/Alien topic are expected to attend the Roswell UFO/Alien Festival this year. Organizers assert that, "From a Biblical Christian perspective it becomes clear that 'aliens' are actually the evil spirits of the Bible. This idea is backed up experientially with the evidence of numerous testimonies of 'abductees', which show that 'alien abduction' experiences stop in the name and authority of Jesus Christ. 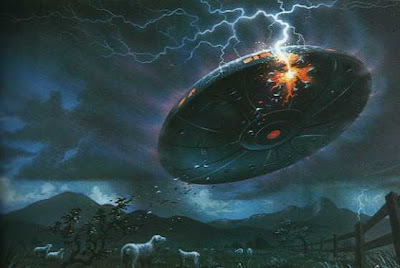 Also the sinful behaviors of the 'aliens' behind abductions, the false gospels and new age messages they proclaim, and their supernatural powers so very reminiscent of those described in the Bible as being had by angels, all adds up to make clear that 'aliens' are in fact the evil spirits of the Bible." Participants will include: William Alnor Ph.D., author of "UFOs in the New Age" and "UFO Cults in the New Millennium"; Gary Bates, from Creation Ministries International Australia, author of "Alien Intrusion: UFOs and the Evolution Connection"; Mike Bennett Ph.D., demonology researcher and host of "FutureQuake" Nashville-based Christian FM talk radio program; Pastor Russ Dizdar, Cult and Occult survivors specialist and deliverance minister; Joe Jordan O.M., alien abduction researcher and deliverance minister; Michael S. Heiser Ph.D., doctor in Hebrew Bible and Semitic Languages and author of "The Facade"; Guy Malone, author of "UFO Phenomena and the Bible"; Mrs. Malone, author of "A Modern Guide to Demons and Fallen Angels"; L.A. Marzulli D.Min., author of "Politics, Prophecy, and the Supernatural"; Pastor Chris Ward D.Min., deliverance minister and author of "Case Files of an Internet Exorcist"; and Stephen Yulish Ph.D., author of "The Real Story of UFOs." There is no such thing as 5th, 6th,etc.. dimension.. There are only 4. 1d,2d,3d, and 4d. 4d is outer space, which you will not enter till you die. Your spirit/soul is 4d. The 6th and other dimensions you refer to, are simply distances from earth. Not alternate universes. Someone outside of our solar system is not 7th dimensional, he just comes from far off. Dont forget that. If you are intersted in finding out the whole truth, esp. if you are vegan, you really need to read the book below. Or dont waste you time at all. Preferably get the thick green version on Ebay. You cannot only preach you have to practice. You cannot preach peace but carry a gun, and want to bomb Russia at the same time. It doesnt work like that. Dont forget that.. You have to live your life, based on what you preach. Peace and love unto all Great Spirit/Jehovih's creations.